‘All good things must come to an end’. Well, that’s a ridiculous phrase if I ever we heard one; why must all good things come to an end? OK, so Christmas is over for another year, and as we packed away our decorations today we did wonder where we would be unpacking them again next year. Twelfth Night, the day that everything tends to get back to normal in the UK, happens to be a big deal in Spain, as El dia de los Reyes Magos is probably a bigger day here than is Christmas Day. This is the day when the Three Kings arrive in Bethlehem bearing gifts, and this is typically the day when children receive their presents, and is yet another great excuse for families to get together to have yet another great meal. We met a colleague the other day (from my days in holiday villa rentals) who is married to a Spaniard and he was busy contemplating preparing a huge roast dinner for the entire family - turkey with all the trimmings! Today is also the day when everyone tucks into the rather suspect looking Roscón - a cake that is shaped to represent the crown of one of the Kings, complete with sweets that symbolise the jewels. These ring cakes are then eaten as they come, or filled with lashings of whipped cream or chocolate truffle. The rings often conceal a hidden secret - the figure of a baby Jesus or a King, which will bring luck, or you may be unlucky and find a hidden bean which means you have to pay for the entire cake. The 5th January sees the Cabalgata de Los Reyes Magos, and it seems that every city, town and village in Spain has their own procession of the Three Kings, arriving in town bearing gifts. The procession in Granada is the oldest in Spain, dating back to 1912. We couldn’t quite face the journey into Granada, with concomitant parking problems, and crowds, so thought we’d stay put and see what Saleres had to offer. Midway through the afternoon, and a pleasantly warm afternoon it was, a van arrived in the village with two huge speakers on the roof, and with some festive music blaring out across the valley - a cross between some traditional Spanish song and Wizard/Slade/Paul McCartney rolled into one. We half expected this to be swiftly followed by a stream of brightly dressed performers tossing sweets into the ever-growing throng of locals, but it sort of died a death. I suppose we have to remember that Saleres has a population of only 300, so parties are fairly thin on the ground. Before Christmas, we had exchanged gifts with our neighbours, and we had received a bottle of Cava from Visi, so felt that this occasion warranted the opening of said bottle, as we waited for the arrival of the Kings. 7pm came, and again, I dragged Andrew away from his creativity, and we stood at the bottom gate. A handful of villagers were standing in the square by the house, and Visi was leaning over her first floor balcony. 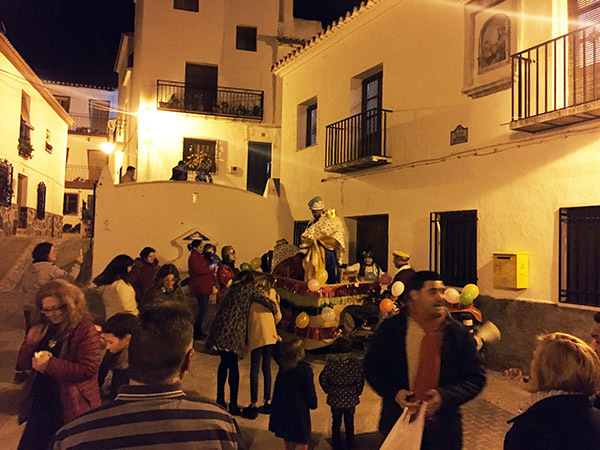 In the distance, there was a sound of music and a rumble, signifying that Los Reyes Magos were on the move, and sure enough, from the far end of the village, a shape emerged through the evening shadows. The rumble grew into the unmistakable sound of……not horses or camels, but a lawnmower, towing a small float. There, in all their glory, stood the Three Kings, and they entered the village throwing sweets, to the assembled families, and children and adults alike scurried around to pick up the treasure. One of the Kings appeared to be female, but we are both hearty supporters of diversity and inclusion. I may sound glib and a little tongue-in-cheek, but truth be told, we loved this very local display of a great Spanish tradition. We followed the small procession into the square, and mingled with the villagers, and genuinely felt a sense of belonging. We enjoyed a laugh with Visi as she oversaw proceedings from her balcony, and one of the village children wished Andrew a ‘Feliz Navidad’. I have no doubt that the parade in Granada, or all other major cities across Spain, with crowds holding upturned umbrellas to catch the showers of sweets, would have been exciting, but I am not sure we would have wanted to contend with the hoards of people. Being here was just another step towards being a welcomed part of this community and, gradually, we are starting to know people by name and recognise their faces. So, Christmas may be over for another year, but a new year has started with all that it promises. Andrew is busy building his portfolio of beautiful designs, I am back to the painting and have a meeting with a radio station next week to discuss ideas for programmes. We feel inspired and excited, so far from good things coming to an end, we feel very much that the good things are really just beginning.